The sweet scent that escapes when you open a bottle of our premium Peach sparkling brew is simply mouthwatering. And why wouldn’t it be? It’s brewed from real, delicious peaches, picked at their peak. Carbonated Water, Cane Sugar, Peach Juice from Concentrate (5%), Peach Brew (Water, Peach, Sugar, Yeast), Flavourings, Acid (Citric Acid), Preservatives (E211, E202), Colours (Mixed Carotenes, Lycopene), Stabiliser (E415) Antioxidant (Ascorbic Acid). So excited that you sell this drink! 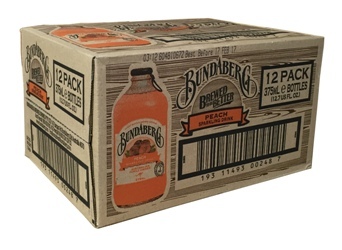 I have been in the UK for 3 years and have been searching where to get the Peach flavoured Bundaberg!! One of my top favourite things I miss from New Zealand, brings back happy memories! Thank you!